80% of the students showed fondness to the given learning activity, while 20% of the students expressed normal impressions and 0% of the students showed dislike. In this second activity 100% of the students showed fondness to the given learning activity. Meanwhile in the third activity, 75% of the students showed fondness to the given learning activity, 20% of the students expressed normal impressions and 0% of the students showed dislike. In that third activity, the classroom’s good atmosphere was destructed by the crying from some students. Depdiknas. (2006). Peraturan Menteri Pendidikan Nasional No. 22 tahun 2006 tentang standar isi mata pelajaran matematika. Hijriati, H. (2017). Tahapan perkembangan kognitif pada masa early childhood. 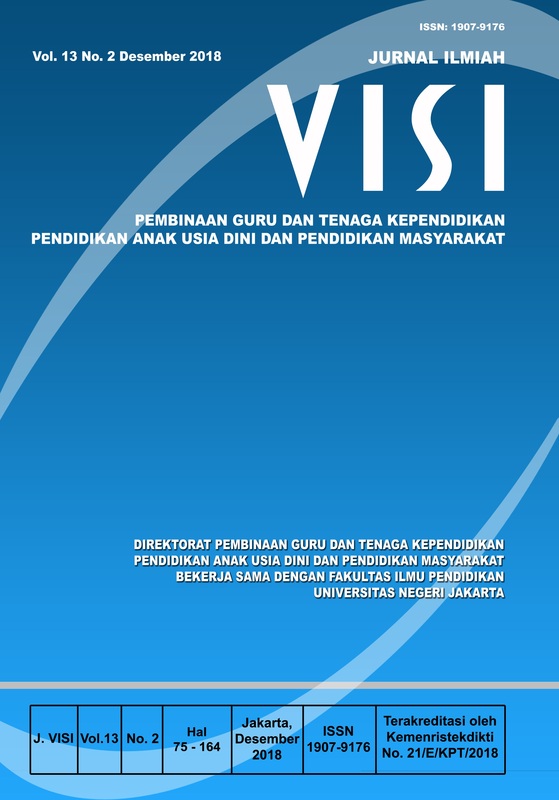 Bunayya: Jurnal Pendidikan Anak, 1(2), 33-49. https://jurnal.ar-raniry.ac.id/index.php/bunayya/issue/view/289. Kartono, K. (2007). Psikologi anak (Psikologi perkembangan). Bandung: Mandar Maju. Lang, R. & Iverson, P. W. (2016). Origami 5: Fifth international meeting of origami science, mathematics, and education. Florida, Amerika: CRC Press. Mariana, I. M. A. (2009). Hakikat IPA dan pendidikan IPA. Jakarta: PPPPTK Untuk Program BERMUTU. Mayer, E. R. (2003). Handbook of psychology, vol. 7 educational psychology 2003. Hoboken: John Wiley & Sons, Inc.
Moleong, L. J. (2005). Metodologi penelitian kualitatif. Bandung: PT Remaja Rosdakarya. Sanjaya, W. (2009). Strategi pembelajaran berorientasi standar proses pendidikan. Jakarta: PT Kencana. Sugiyono. (2011). Metode penelitian kuantitatif, kualitatif, dan r & d. Bandung: Alfabeta. Suherman, E. (2003). Strategi pembelajaran matematika kontemporer. Bandung: JICA Universitas Pendidikan Indonesia. Westwood, P. (2004). Learning and learning difficulties: A handbook for teacher. Camberwell: Acer Press. Yusuf, S. (2014). Psikologi perkembangan anak dan remaja. Bandung: PT Remaja Rosdakarya.